I was wondering how I would incorporate last year’s censored poems into this poetry adventure. Sure enough, on the first day of 2014’s testing window, I am ready to share the work that originally got me in trouble. On March 19, I posted poems to this blog that released sensitive testing material to the public. I was told I had compromised my standing as a highly qualified and ethical teacher in New Mexico. My poetry almost invalidated the test scores for my students because someone could have read the poetry (that day I had 12 hits on my website). I was furious but humiliated. Emboldened but hesitant. I wanted to release the poems back out into the world, but was told that my license could be put in jeopardy. My advice from last year’s director was to seek legal counsel if the poems were released again. And today, a year later, the same testing material that inspired those poems was the basis for a reading portion of the test. Again. For the third year in a row. If I really wanted to expose sensitive testing material I would have just told students the answers to questions they’ve already seen before!!! 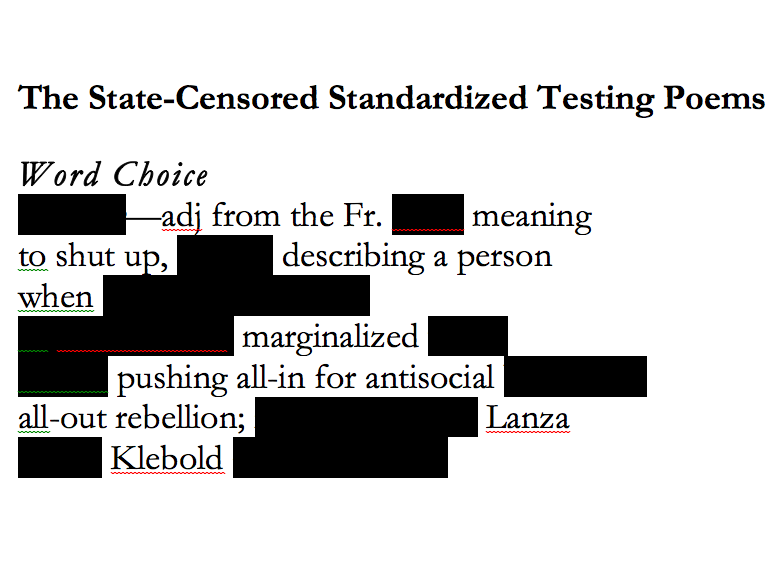 So here I have for you The State-Censored Standardized Testing Poems. 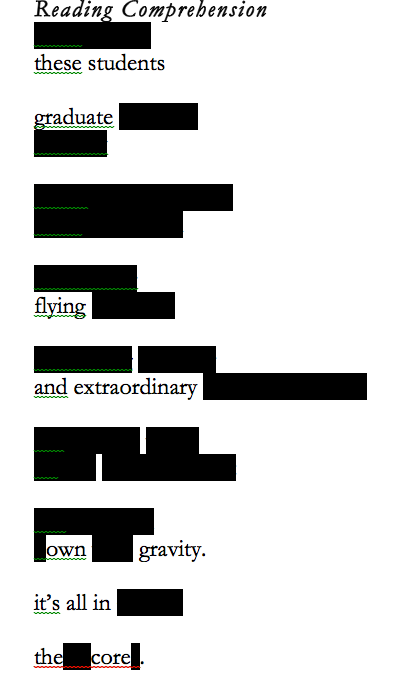 I played with their form and the black outs are where the poet deemed the content to be too sensitive. I got your back, Hannah Skandera! In reflecting, as poems this work wasn’t that amazing to begin with. The first, Word Choice, felt forced. It still does even with a bit of erasure. And in re-visioning Reading Comprehension, I realize I had said a whole lot bringing not so much to the table. Now it has a little something from distillation. The power here isn’t the poetry, but those black lines. The silence is on my terms now. And during this month, I have had nearly 1000 hits to my blog. Now people are reading and thinking. At least in this case Art and Activism is more powerful than picketing. Onward Educators! It’s all in the core!